Last week Telco Together had the pleasure of hosting a Skills Exchange at the Cisco North Sydney office. 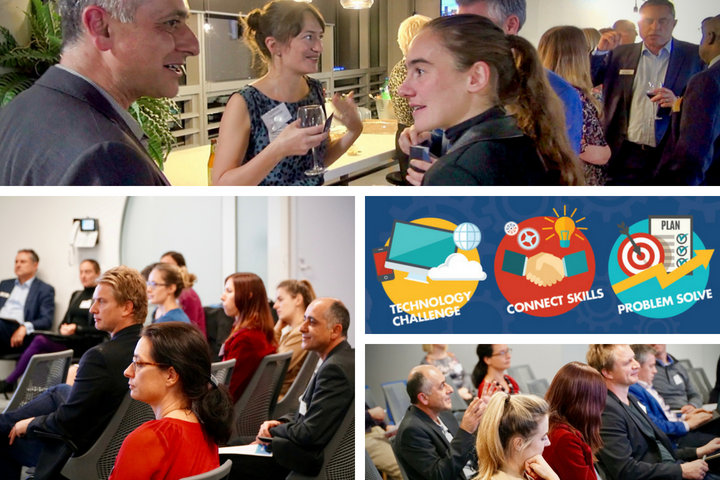 Telco Together’s Skills Exchange events support charities to pitch an IT problem to an audience largely made up of our telco/telecommunication members. Over the 2 hour event the charities are given time to talk about the story of their charity: its mission, the value it provides the sector and the successes they’ve had, as well as an issue that’s limiting their ability to assist their community. The audience, often unfamiliar with the charity sector, are provided with information in the lead up the event about the charity and the IT problem, and asked to allocate up to two days of their annual volunteer time to assist. While the charities are coached on their pitches in the lead up to the event, the volunteers are also provided guidance on the value they can provide. The charities represented were SANE Australia, supporting Australians affected by complex mental illness, the Heart Research Institute dedicated to ensuring no-one dies needlessly from cardiovascular disease, The Shepherd Centre supporting young children impacted by hearing loss, and the Australian Research Alliance for Children and Youth, enhancing the wellbeing of children and young people by transforming evidence into policy and practice. The issues these charities presented included: support to create a business and technical plan for a CRM implementation; advice on how to test a new payment processing platform and data transfer hub; a digital marketing review to assist with SEO optimisation; and the latest tech views on collaboration software to help various stakeholders communicate across locations and sectors. All the charities found at least one IT practitioner willing to volunteer their time to help them scope their problem and then assist with solving them. There was a noticeable spirit of goodwill between charities and the tech volunteers, all there to learn and contribute in their own way to the community. These pitch events are not a new idea; in fact, many corporations are allocating time for staff to support the nonprofit and start up entrepreneur sectors by hosting hackathon events. These are designed to give the nonprofit sector a chance to present their problems to an audience of experts that can allocate time and energy to build their capacity. In a time when business is seeking greater clarity on their role within the community, the Skills Exchange provides a safe and encouraging environment for all participants to share their expertise, connect organisations and invest in community driven solutions for lasting and effective change. The next Skills Exchange is in Melbourne on the 24th July. Both charities and volunteers can register here.